In the end, it was much ado about nothing. 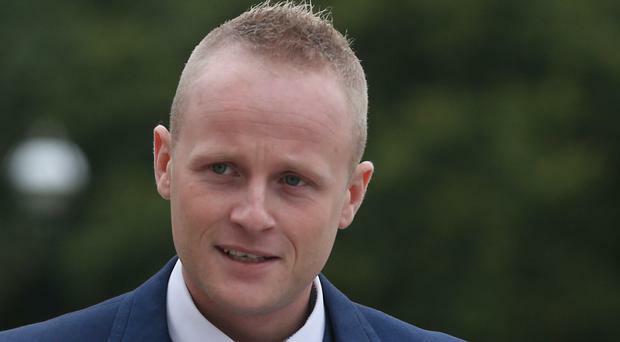 Jamie Bryson's evidence to the Northern Ireland Affairs Committee in Westminster was an anti-climax. He was one of four people - all hardly household names - questioned by the committee for an hour. Proceedings involving Paul Braithwaite, Ruth Taillon, Derek McCallan and the loyalist blogger began at 9.27am. The session got more attention than it merited after Alliance hit out at the committee for inviting the "relentless self-publicist". Bryson's opponents should realise they are best paying no notice to him. Being before the committee with a media fanfare was a victory in itself for him. Chairman Dr Andrew Murrison began by stressing that everyone must be signed up to "peace, the ballot box, the rule of law and so on". He continued: "Mr Bryson, you have in the past been associated with some remarks which perhaps run contrary to those ideals." He asked the former flag protester to clarify that he had turned his back on "proscribed paramilitary organisations". Bryson said the only way forward was through the law and peace process and there could be "no place in society for terrorism of any form". Just two MPs asked questions, and only Kate Hoey was positive towards him. The loyalist aired his well-known views on the Agreement, and agreed with the Labour MP when she said the accord's critics were treated as if they were saying they wanted to kill newborn babies. Ms Hoey's party colleague John Grogan was less amenable. "You're on the fringe of Northern Ireland politics. Could you remind me - I think you've had some electoral adventures - what's the most votes you've got?" he asked. He replied saying he got 167 votes when he ran for council in 2011 aged 21. But he insisted he spoke for unionists who felt left behind by the political process. The two DUP MPs present - Gregory Campbell and Jim Shannon - didn't question him. But the fact they showed up and weren't hostile is significant, given how he waged war with their party over Nama. A minor miracle in itself - or else they've learned it's best ignoring him.